The unique quality of the Buddha (and indeed even the Bodhisatva Prince Siddhattha) was His “Mettha”- loving kindness. In fact it was this quality which urged him to renounce and go forth in search of finding a way out of suffering. He (Prince Siddhattha) simply did not accept that beings are born (created) to suffer. For Him the fact that we get born to suffer was unbelievable, as He too as a Hindu believed in God (Athma) and his creation. If suffering is the lot by nature, there must be a way out too offered by nature itself. He took it upon Himself to save all beings from this predicament. In the end he found out that it was “craving” that causes suffering. We suffer because we identify with a self. "It's me who suffers". In short if a being were to be born, then live without craving, he would die not to arise (be born) again. There will not be any “samsara”. I feel that plants, which are not so evolved like animals, do not really get caught to this “craving”. Plants have only a sensitivity. Why the Prince underwent immense hardships in search of a way to end suffering is because of his unconditional love, that he did not want to see anybody suffering. So how could we stop craving. The Buddha has given many methods. Various techniques of meditation. However, what one should realize is, whatever, technique one uses, EACH ONE OF THEM should be practiced in a base of loving kindness. I mean one’s heart should possess kindness first of all. 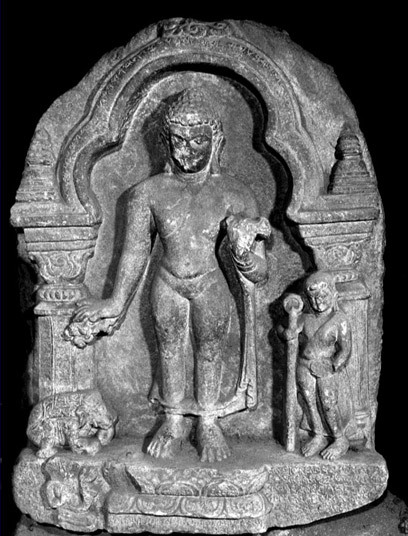 Buddha and Nalagiri - Bihar -India -(11 -12th Century A.D.) Stone. So "mettha" leads the way.. Try the Nalagiri Strategy with your mind, as Ajahn Brahm says. Whenever you catch the mind running to and fro, have loving kindness to that aspect also, and allow things to be so, open your heart to the running mind, and instead of being upset and scolding yourself, say, “ mind I know you are running all over the place, I accept you as you are and love the running mind”…. Soon the mind will stop running. Nalagiri was the name of the royal tusker belonging to King Suppabuddha. This king was the father of Devadatta. Devadattha, who was jealous of the Buddha, plotted to kill Him while He was in Rajgir..... They brought this huge tusker, and gave it alcohol, then hurt and wounded it with spears and irritated it so much that it was enraged beyond compare. Then they let it out loose from a special gate at Rajgir into the narrow streets of Rajgir, where the Buddha was coming down on alms round. The intoxicated elephant started running down this street furiously tearing down everything on its sight. Everybody ran helter-skelter, when they saw this huge enraged elephant come charging down the street. The Buddha and his faithful attendant Venerable Ananda alone, stayed on this street, without running away. 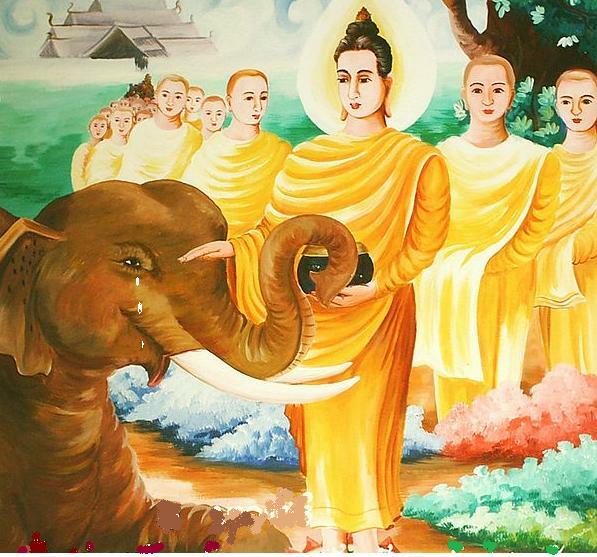 Bhikkhu Ananda stood in front of the Buddha, so that the elephant would get him instead of the Buddha. (So you see Ananda Thero was quite different to St. Peter). However, the Buddha, came forward and with his immense mettha, calmed the animal, who bowed down at his feet with tears running down his elephantine face. For..., the Buddha did not think about Himself, He only felt the urgency of bringing the pain from which this huge animal was suffering, to an end. And that’s just what He did. With His immense metttha, He ended the suffering of that animal, and the poor animal felt His loving kindness in his entire gigantic body thus, curing him of his pain and intoxication. He bowed down at the Blessed One's feet crying in gratitude.